It took me two years to muster up the courage to start this blog. With so many beautifully executed websites out there, I couldn't help but continuously ask myself a series of discouraging questions: Who will read it? How am I unique? What could I possibly have to offer? With Rob's persistent encouragement, I registered a domain name, took pictures of what I was already planning to cook that night, and started it up. And I've realized since that even if not a single person reads what I put out, it is still worthwhile because it simply makes me happier. This is all a long-winded way to say this: if you're thinking of starting a blog, do it. The world of food is big enough for us all. 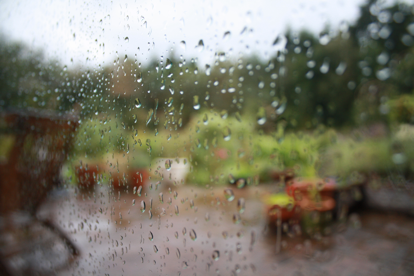 Last year, well into the middle of October, you would have found me outside, stretched out on a deckchair, shivering away in the drizzling rain, stubbornly clutching an ice cold beer. This year, rather than risking catching some sort of hypothermic-related illness, I decided it was time to throw on another layer of clothing and to start embracing the changing seasons. 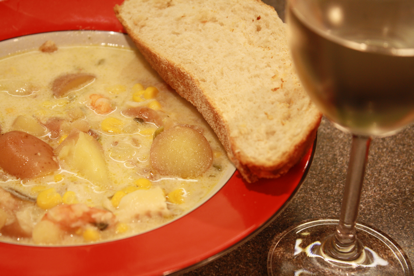 What better way to celebrate the end of a sunshine filled summer and the beginning of a crisp red and golden coloured autumn than by putting together a brilliantly flavourful and warming chowder packed with chunks of smoked haddock, potatoes, corn and shrimp. If you end up purchasing a piece of smoked haddock that still has the skin on, it is best to take the skin off before you start working on the rest of the chowder. This can be slightly fiddly and I promise that you will smell like fish for the next few days. 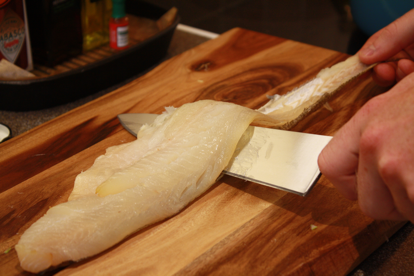 With the skin side of the fish facing down, begin by separating the skin and the fish using a sharp knife. When there is enough skin to hold onto, get a good grip and pull it taut. Continue to slide the knife between the skin and fish while pulling on the fish skin with your non knife hand. Chop all of the bacon up (a good pair of kitchen scissors does this job brilliantly). Start the bacon off in the saucepan with a good lug of olive oil over a medium heat. Finely slice the spring onions and chillies (if using) and add to the pan. 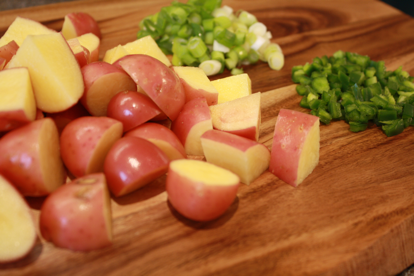 While keeping an eye on the pan and stirring often, chop the potatoes up into 2cm chunks. 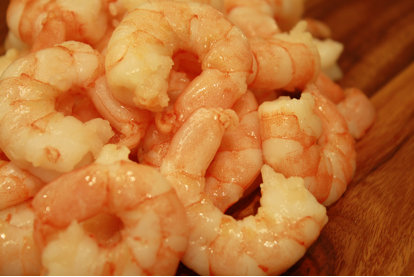 Add these into the saucepan and give it all a good mix. If you are using corn on the cob (I like your style), place a tea towel on the cutting board with the edges of the towel ruffled up. Slice off one end of the cob cleanly so you have a solid base to rest on the cutting board. While holding the cob upright on the board, gently work the knife down the edge of the cob to the base. The tea towel should be collecting the kernels as they are cut off. Repeat this process with the rest of the cobs. Then tip all of the kernels from the tea towel into the saucepan. 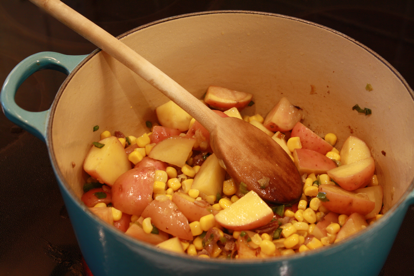 If you have taken the easy way out and used corn from the tin, open and pour the contents from the tin into the pot. Have a small giggle at the thought of someone else going through the effort of using actual corn on the cob. Then feel slightly ashamed for mocking someone who is putting the extra effort in. So rude. Honestly. Give everything a good stir. 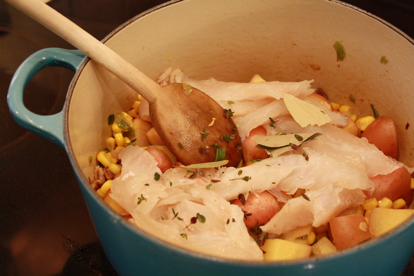 Place the haddock on top of everything in the pan. Throw in the bay leaves and thyme. Then pour all of the chicken stock over everything. Cover the saucepan with a lid and cook for 12 minutes over a medium flame. Stir occasionally. After 12 minutes, add all of the single cream and the peeled shrimp to the chowder. Give it all another good stir. If you bought a chunky bread loaf to go with the chowder, put the bread into the oven for the last 10-15 minutes to heat it up. With the lid back on the saucepan, cook for another 5-10 minutes on a low heat. 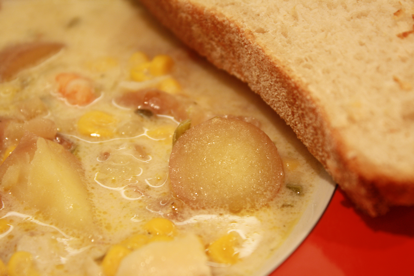 The chowder is ready to serve or you can use a potato masher to mash everything up together. 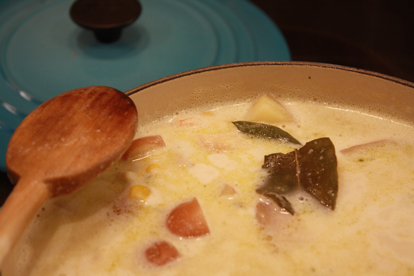 I tend to mash half of the contents up and mix everything together to give the chowder some great texture. *Isn't he cute, with all his silly British measurements? Here's a grams to ounces conversion website.